Take taxi from East Exit taxi stand (10-min ride). 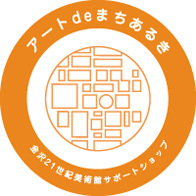 Note: For detailed information on transportation to and around Kanazawa City, please see the Kanazawa Tourist Information Guide website [http://www.kanazawa-tourism.com/]. Please use the Kanazawa City Hall / Art Museum Parking Lot. The parking lot is located underground between City Hall and the Museum. ※The parking lot and nearby roads are crowded weekends and busy seasons. If the parking lot is full, please use a nearby public or commercial parking lot. ※Large buses must be parked at public parking lots (Ishikawa Prefecture Kenroku Parking Lot, Kanazawa City Nagamachi Kanko Parking Lot). The bus stop in front of the Museum（Honda-Dori, City Hall side）may only be used for unloading and loading passengers. No (base fee) charge for the first 30 min. Thereafter ¥150 per 30 min. ¥1,000 for 23:00 to 8:00 the next morning. *Please validate your ticket in the museum to receive the base fee deduction on weekdays after 17:45 and on Sat, Sun, Holidays. Visitors who fail to do so will be asked to pay the base fee (¥350 for 30 min) on top of the time charge. Ticket validation machines are located near the Ticket Information Counter and the museum’s underground entrance. Parking for bicycles is located on ground level by City Hall. *When Monday is a national holiday, closed on the following weekday instead. Ticket sales end a half-hour before closing. Membership in 21st Century Museum of Contemporary Art, Kanazawa is open to all. Membership brings with it special privileges that allow you to fully enjoy the Museum. It satisfies your interest in contemporary art and the Museum itself, and your desire to get the latest museum information. Through your membership, you support 21st Century Museum of Contemporary Art, Kanazawa. While enabling you to view exhibitions, membership also brings you a sense of involvement in the Museum and helps you discover new ways of enjoying contemporary art. Note: Membership applications are taken only in Japanese. Publications issued to members are also in the Japanese language. 21st Century Museum of Contemporary Art, Kanazawa has established “Promote the Arts Day” in order to encourage people to foster richer sensibilities through closer involvement with the arts. On this day, citizens of Kanazawa can view “Collection exhibitions” organized by the Museum for free. Citizens will receive a free viewing pass at the main reception counter upon presenting proof of their residency in Kanazawa. Kanazawa City has established “Culture Day (November 3)“ as “Kanazawa Citizens Free Art Day” since fiscal 2019 in order to encourage people to foster richer sensibilities through closer involvement with the arts. On this day, citizens of Kanazawa can view “special exhibitions” and “Collection exhibitions” organized by the Museum for free. Citizens will receive a free viewing pass at the main reception counter upon presenting proof of their residency in Kanazawa. In 2018, “Kanazawa Citizens Free Art Day” falls on October 20 (Sat). 21st Century Museum of Contemporary Art, Kanazawa and Kanazawa Noh Museum have embarked on a program in which they provide visitors with information about shops on nearby shopping streets and visitors are eligible to receive various services at participating shops. Visitors should present a ticket stub or their Museum membership card at stores displaying the official sticker. Either ticket stubs for Kanazawa Noh Museum or exhibitions organized by 21st Century Museum of Contemporary Art, Kanazawa (advance tickets or tickets sold that day) are accepted. For details, please see the map of participating shops posted in each museum. Details of shop information and services eligible are subject to change. 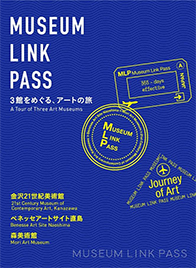 As part of an inter-museum relationship that accentuates the distinctive character of each museum, Benesse Art Site Naoshima, Kagawa, Mori Art Museum, and 21st Century Museum of Contemporary Art, Kanazawa are issuing a passport, the “Museum Link Pass,” that is valid at all three museums. How to Use the Link Pass : Passes are offered free to applicants at each museum. Please inquire at any of the three museums. Your pass will be stamped with a starting date at the first museum. (Ticket buyer only. ) After having your pass stamped at each of the two other museums, you will receive a special present at the third museum. (Presents are the same at all three museums.) By showing your pass, furthermore, you can receive a discount on your admission fee (and viewing fee) at all three museums. Passes are valid for a maximum of one year from the day of their first use at the first museum.